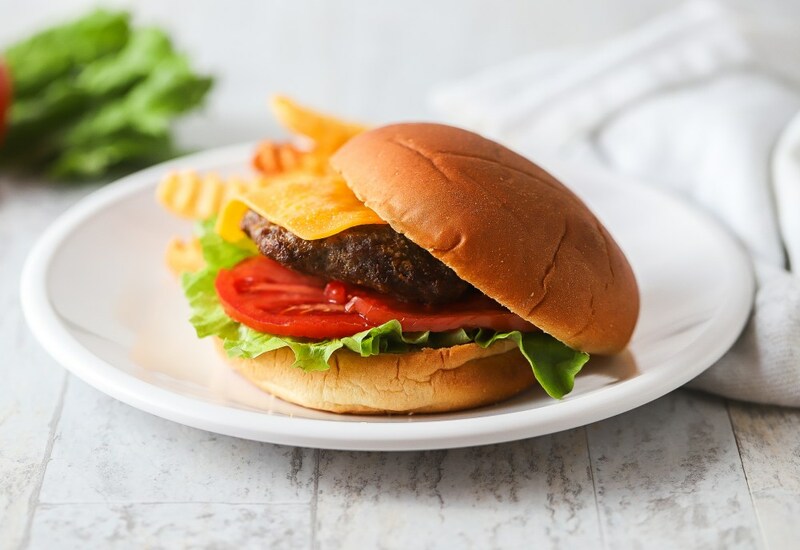 Hamburgers made in the air fryer are ready in about 20 minutes, making them a great meal for busy weeknights or for casual get-togethers. Top them with your favorite ingredients like the classic lettuce, tomato, mustard, and ketchup or mix it up with goat cheese and caramelized onions. Try different seasonings in the burger, such as minced garlic and curry powder instead of the Worcestershire sauce. Ground chicken, ground lamb, or ground pork are good alternatives to the ground beef for a different flavor. Per Serving: 526 calories; 27g fat; 27.4g carbohydrates; 41g protein; 119mg cholesterol; 705mg sodium. I am always cooking for a family of 8, so being able to toss a bunch of burger patties in my air fryer makes life so simple! My air fryer has a drip pan at the bottom, which is helpful to catch the grease droppings. I don't make my burgers medium rare, but if you like a medium to well done (not overcooked) burger then this is the recipe for you. These burgers look and taste like they came off the grill! I live in Florida and it rains a lot so it's sometimes hard to grill. Whenever I am craving a delicious burger but weather doesn't permit me cooking outside, I throw them in my air fryer now! Only thing I did differently was season my burgers ahead of time to allow the seasoning to really flavor the meat.